Discussion in 'Contrails and Chemtrails' started by Mick West, Apr 21, 2014. This video of Rosalind Peterson at the UN in 2007 has been repurposed on social media as if it's something new. It's been posted with such headlines as "100% Proof!" and "Leaker Speaks Out At United Nations". Peterson does not work at the UN, or have any connection to the UN at all. Peterson is a retired crop loss adjuster (a type of insurance agent working in agriculture). She worked for the USDA in Mendocino, California. Peterson is billed as "President of the Agriculture Defense Coalition", and while this is true, the ADC is just her. It's just the name of her personal web site. It was in 2007. The bears repeating as the video frequently gets repackaged, and people think it's something new. The session she spoke at was titled "Coping With Climate Change: Best Land Use Practice"
This panel will focus on innovative ways to minimise and cope with the negative impacts of climate change, primarily as they present in erratic weather patterns. These events aggravate famine and mass migrations in areas already burdened, particularly in tropical and subtropical regions. The panel will address the effective local initiatives utilised in combating desertification--planning and zoning techniques, which can stem the rapid loss of agricultural lands to urbanisation. How can these be overcome without sacrificing issues of equity? What can NGOs, national governments and UN agencies do to encourage compliance? In addition, the panellists will consider the vital role that the preservation of biodiversity and reforestation policies can play in reducing the amount of carbon dioxide entering the atmosphere. claimed NASA and the US Air Force used canisters of chemicals to experiment with the ionosphere repeatedly with no oversight . This increased pollution and affected drinking water purity, for example, water testing conducted by the State Department of Health in California and Arizona showed unusual traces of chemicals such as aluminium and barium . The use of aluminium in such experiments also caused the destructions of plants and trees in the region as they could not absorb water or necessary nutrients . Finally, she concluded by adding that increased jet fuel emissions released nitric acid into the atmosphere and depleted the ozone layer . Ms . Peterson believed it was time to concentrate on reducing pollution at its source and not invest in geo-engineering schemes, which could bring about yet more damage . We have to stick with what we can prove. We have to stay away from opinions and beliefs. And if we go to sue someone, we have to have enough rock solid evidence that is so tight to make a case so that we don't lose the case, and that we have many many people, in other words experts in various fields, to testify on our behalf. This mean university professors, this means people that can come and back up our statements, back up the studies, where we can prove that the jets for example reduce the amount of direct sunlight reaching the earth, they change the climate. And so what happens is, that when I see though, that we are talking about suing, ... who? In other words, I find that the direct proof to link up who's doing what ..., and also I can tell you that in ten years of research, other than aluminum coated fiberglass, chaff releases by the US Military, I have no proof whatsoever that the jets are releasing anything but jet fuel emissions. Now I can prove that the rocket programs in the United States are releasing trimethylaluminum, aluminum oxide, barium. I can prove the rocket programs in the United States are just coating us with toxic chemicals all the time. And these programs are listed at NASA, NOAA, the US Air Force, the US Navy, I mean there's tests going on all the time. The US Navy CARE program is a prime example. So I can prove, I have so many documents I couldn't even put them all on the internet, even if I tried, because there's Pentagon reports, there's all kind of reports dating back twenty, thirty years. When it comes to proving what the jets are releasing, I don't have the documentation, and I don't have a single study, I don't have a single solitary verifiable evidence that the jets are releasing anything except military releases of aluminum coated fiberglass by military aircraft. So there's a differentiation for me in putting my name or associating myself with something where I can't back it up. Now if anyone has direct proof, they've got university studies, if you've got documents, government documents, if you've got reports, then that makes a big difference. But right now, after ten years of research, I can't do it. "and the effects of normal persistent contrails." Exactly when in the video does she say this? Sorry- but how is she DEBUNKED? She is not debunked - the claim about what she is saying is debunked as it's completely false. Her presentation only discusses geoengineering in the abstract future tense, and focuses more on weather modification (cloud seeding), sounding rockets in the ionosphere, and the effects of normal persistent contrails. Her claim is completely false? You did research refuting her claims? You seem to have trouble following this simple concept - what is debunked is the claim made about what she is saying - the presentation BY OTHERS of what she is saying is false. - I would say she has not proved that the chemicals are going to be detrimental to our health because it depends on what ones are actually used and IF they ever get used, but it would be wise to be cautious and not to rush into it and so is a fairly reasonable position (though probably not a fully informed one). Like the claims about cloud seeding? What's to refute? SHE is not debunked. The title of the video, "Chemtrails, Here is your PROOF 100% Real "MUST WATCH" " (as it appears on youtube) is what is debunked. Mick was generalizing this, as the same video appears in multiple social media locations with similar misleading titles. If you actually watch the video, she never once says the word 'chemtrail', and does refer to persistent lingering contrails, and how they behave. She also references weather modification (cloud seeding) and speaks of potential geo engineering in a future tense. There is really nothing to debunk in what she says. It could be argued that her claims of heat trapping and light blocking caused by contrails should be researched more. The misrepresentation of what she is actually saying is what is debunked. At 4:58 she mentions persistent jet contrails, and how she believes they are affecting photosysnthesis by reducing sunlight. She did not include the word ‘normal’, but that would be a redundancy. She says ‘persistent jet contrails’ a few seconds later when referencing NASA’s explanation of how contrails spread into cirrus clouds, and the claim that they trap heat. She follows that by explaining how persistent jet contrails spread across our skies. The point is that she references persistent jet contrails multiple times during her presentation, and does so accurately for the most part. She never states, nor implies that these contrails are purposeful, that they are ‘chemtrails’, or that there is anything nefarious about them at all. She is concerned how they potentially affect agriculture, by reducing sunlight, and trapping heat. That she's "addressing the UN". (It's just a conference at the UN). Or, like in the case of Kristen Meghan, she states that she is a chemtrail believer, then goes on to her claims of whistleblowing about USAF personnel and overexposure to carcinogens on bases where she has worked. These claims then somehow get morphed into her being a 'chemtrail' whistleblower, in spite of the fact that she has clarified otherwise right here on this site. 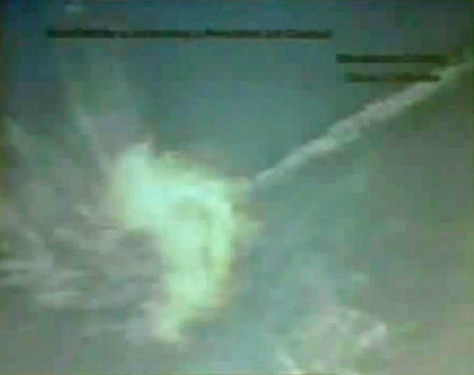 One other thing I noticed in the video, about 6:55 to 7:15, was the picture of a contrail and what she describes as a "burst" at the end of it. This is an example of argument from ignorance, i.e. we don't know what that cloud is, therefore it must be chemtrails geoengineering. This is one of the standard logical fallacies. If anyone on the board has a better idea what this cloud might be, I would be interested to hear it. 1. Does the US government or any private business/organization EVER, for any reason, release chemicals into the atmosphere by way of a jet or plane? I think, if you are to believe Ms. Peterson, the answer is unequivocally, yes. The question then becomes, "For what reason and shouldn't there be some type of oversight and public discussion concerning the release of chemicals into our ecology? I don't buy into the theory that there is a global conspiracy to poison the worlds population through chemical aerosols. These projects are very likely exactly what she says they are; experiments in weather modification and are possibly harmless. Having said that, I believe that the people living in areas where the research is done have a right to know the details of said experimentation. I believe this is a reasonable and prudent position to take and is EXACTLY the point Ms. Peterson is trying to make in her talk. She is calling for oversight and regulation: a sane, rational, and reasonable request. You seem to be confusing weather modification with the chemtrail theory. Are you asking for more oversight of normal cloud seeding? Or more oversight of some theoretical thing for which there is no evidence? Does the US government or any private business/organization EVER, for any reason, release chemicals into the atmosphere by way of a jet or plane? and as this video demonstrates the use of DDT, sometimes the long term effect wasn't desirable. I thought that "Rosalind Peterson" was growing, and learning. AM I incorrect? Rosalind Peterson was a no show at the Shasta County Supervisors, for what it's worth. Wigington said something about sick family members. These projects are very likely exactly what she says they are; experiments in weather modification and are possibly harmless. Having said that, I believe that the people living in areas where the research is done have a right to know the details of said experimentation. You are talking about weather modification here, shooting chemicals (salts) into the air (clouds) or releasing them from airplanes. That is called cloud-seeding, making clouds rain off. The public actually often is being informed about cloud seeding activities via newspapers etc. So, if you are talking about weather modification/cloud seeding, and people are being informed about it happening beforehand, and it is actually pretty harmless (and, one might add, its success is disputed), what exactly is the problem? Are you kidding me? That's absurd. There is NO evidence it works (like you said), so any plane spraying anything into the clouds is suspect. Please provide evidence to back up the multiple claims and inferences you made that I suspect are completely contrived. 1. That "cloud Seeding" is widely practiced. It varied by state, but "Notices of Intent" are published in some local papers before spraying. e.g. ...so any plane spraying anything into the clouds is suspect. (NOTE that there are also ground-based silver iodide, and propane generators used, as well). Please provide evidence to back up the multiple claims and inferences you made that I suspect are completely contrived. ad 2: For some examples, please see Mick's post. Also, recently, a German newspaper informed people about cloud seeding (Hagelfliegen, "hail flyers"): http://www.stuttgarter-zeitung.de/i...auf.cba9196e-5e5d-4a05-9086-f196c31ea41e.html. The article discusses both why it's being done (protecting harvests or grapes (wine regions! ), or protecting new cars from damage by hail (Volkswagen)), and by whom, it's paid for by farmers, companies, counties or cities. Also, the article discusses how cloud seeding is somewhat inefficient against huge thunderstorms, due to size. You see, in Germany there is about a handful of these planes. Are you saying that "cloud seeding" isn't done from planes? If you read what I wrote, you will see that never said that. I said: it's done both from the ground (see the notice from the 1960s) ) and by plane (see Stuttgarter Zeitung). So, I stand by my previous statement: yes, cloud seeding is not a secret, and is in fact often even made public beforehand. And I would also agree to the statement (I actually did not make before), that cloud seeding as a means of weather modification is a fairly wide spread practice. And, finally, I don't mind being asked for evidence. In fact, I encourage it and I love providing it. Having done that, would you now mind taking back the accusation against me of making things up? Ok. Glad to know "cloud seeding" is now normal. That's a pretty good demonstration of why there's so little public discussion about it, by the way: Every attempt is liable to be poisoned by chemtrailers and the like. May I ask you this question? In what way is cloud seeding dangerous, and how do you think it causes mass health issues? It is performed from small propeller planes or ground based sources, and it is not visible from the ground. Chemtrail believers have always claimed that the long white lines in the sky, or persistent contrails created by high flying commercial airliners are "chemtrails". So which one is it? If anything in the form of smoke or such things coming from an aircraft is going to be lumped into the "chemtrail" category, does that mean skywriting is now a deadly and nefarious spraying operation as well? How about air shows, with smoke generators in the engine exhausts like the Blue Angels use? Sure. Take it back. Sorry. Do you support the idea that weather modification that involves the release of chemicals into our atmosphere be regulated and that the public has a right to know if and when such activities are taking place? Again, this is only prudent and sensible. It is really the only point I'm trying to make. I realize, Mick, you have a lot invested in the whole "chemtrail" issue. I have no opinion on that other than to say that what some propose to be "chemtrails" are probably weather modification attempts using aerosols from planes. If this activity is "safe" and poses no threat to the public, then I would think any sensible plan would include public notification. Keeping such activity from the public only heightens the hysteria from those that believe harmful chemicals are raining down on us. I realize, Mick, you have a lot invested in the whole "chemtrail" issue. I have nothing invested in "chemtrails". I'm a debunker. I go by the evidence. THere's no evidence that the trails people point at are anything other than contrails. ...other than to say that what some propose to be "chemtrails" are probably weather modification attempts using aerosols from planes. Actually, what I continue to see from those who claim "chem"trails, I recognize them as just perfectly ordinary contrails, resulting from the passage of normal jet airplanes. They are caused by condensation of H2O that freezes in the very cold environment of the upper atmosphere. There is simply no extra weight-carrying capacity for a typical passenger or cargo airliner to load "aerosols"...and of course, there is no provision nor apparatus or method to "spray" anything, anyways. Keeping such activity from the public only heightens the hysteria from those that believe harmful chemicals are raining down on us. So Chemtrails don't really exist? Why devote all this time and adamantly try to go against what the general consensus of the public is, and the worry that they have? Not everyone comes to metabunk, regardless of how many topics, and threads ol' Mick writes. So chemtrails are like fairy tales? Is that what "debunkers" are saying on here? Not exactly. I'm saying there's no evidence that they exist. That's a wide brush you are painting with when you claim what the "general consensus of the public" believe. All people are doing on here are explaining what those long white lines in the sky truly are, and backing it up with proven science and aerodynamic theory as well as documented facts. The chemtrail community claims a lot of things, and this is where we step back and take a glance from a logical and scientific standpoint. So what is needed to prove the "evidence" in your eyes, about chemtrails and geoengineering. You miss the point. This site is not about proving or disproving broader claims. It's about looking at the evidence, and removing bunk. Please read the Posting Guidelines. This thread is about Peterson's speech. If you want to talk about something else, then check first to see if it has been covered, and then start a new thread (or add to the existing thread on the topic). Yeah I missed the canvas with my brush, sorry. Your right about the speech. Back to the topic. the treason and lies being spread from this website? As noted just above, the point here is to examine the claims that allege "chem"trails. And to prove otherwise. That is the essence of "de-bunking". Getting deeper it is this: Whenever a claim that alleges "chem"trail is a claim based on bunk....then that claim is proven wrong with thorough evidence and science to the contrary. Those who advocate for "chem"trails bear the burden of proof. On the other hand....the 'majority' of people on this planet understand the science and reality of contrails, HOW they are formed, WHY they are formed, and WHAT they are. It is a knowledge steeped in decades of scientific fact and research. SO.....we have a few on the 'fringe' claiming "chem"trails, and a vast majority of science that points to perfectly benign results from our techological world....High Bypass jet engines burning fossil fuels at high altitudes/very cold temperatures producing innocuous cirrus clouds..
Sure....these cirrus clouds (because, deep down, this is all that a contrail is) are "artificial" or "man-made"....but, 'Mother Nature' produces FAR more on 'her' own, just as part of Earth's normal atmospheric processes.